Full disclosure, I know one of the guys who worked on Burt Destruction, which landed on Android and iOS stores a couple weeks ago. Jeff Reitman is the CTO of RunWilder Entertainment, the game's maker. He and I performed in some stand-up comedy showcases together back before I joined Kotaku, and Jeff was a favorite target every time we did a roast together. This game plays like his revenge for that. Kidding, kidding, folks, Jeff's an expert in his field, having worked for LucasArts (on Star Wars: The Force Unleashed), and has personal experience with things that are really hard and last about 40 seconds. (Waits for it.) Alright, I apologize, it's really unfair to say mean things about a big, sensitive, easy target. But enough about the size of this game's hit box! OK, now I'll be serious. 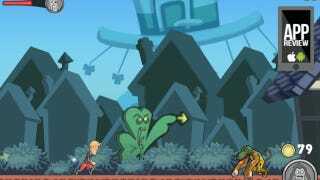 Burt Destruction is a side-scrolling platformer built on some conventional gameplay themes, underpinned by zany characters and zinger-filled cutscenes that play out like an Adult Swim cartoon. At least, what I've seen of them play out that way, because Burt Destruction can be frustratingly tough even in its earliest stages. Burt Destruction's premise trades on the kind of lowbrow irony you'd expect from, well, guys like me performing standup comedy. Burt's a slacker twentysomething with a Bigfoot and a dodo for friends, and can briefly transform into a giant indestructible musclehead. He's gone out to destroy Team E.V.I.L., comprising the Yeti and various fanciful beasts like a chupacabra. The Yeti, the leader, wishes to unleash a destructo-ray on the world to make everyone "like me! Hairy." The game's levels are themed to its villains. Two worlds are available so far. Burt runs automatically, so your only job is to tap the screen to jump (twice to double jump) or tap an icon to summon a friend to help (who acts as a smart bomb, clearing the screen of all threats.) The game's major frustration is in how simple it should all be—just jump over bad guys, maybe land on one or two, pick up the invulnerability icons and cruise to the end of the stage. But the total lack of save points, the brevity of your invulnerability sessions, and the limited effect of bringing Bigfoot in to wipe out everything on the screen, have me stuck on the fourth level of the game's first world. A big problem is, yes, the hit box, which extends well beyond whatever physical space Burt occupies. Coupled with the varied interactions with foes, it becomes a big problem. Some baddies, if you land on them, you bounce up, Sonic-style, and can chain together attacks. This is useful because the more destruction you cause, the faster you fill up the meter that unleashes the roided-out Burt. Yet on some other enemies, you pass right through them after landing on them. When a series of three come at you, it's better to try to double-jump over all of them rather than take on any, because of the cheap death that so frequently comes from the hit box. This is for an un- or marginally upgraded Burt. Things like extended invulnerability time, powered-up friends, and enhanced coin collection are all available with the coins you collect in every playthrough, and keep even if you fail the level. But the prices on upgrades are so large as to feel like Burt Destruction is steering you to an in-game purchase of virtual cash, just to acquire tools that make the game more manageable. Burt Destruction is free right now on iTunes, but in addition to adjusting the hit box, Burt Destruction should also lower its upgrade prices, or lower its list price of $1.99. No matter what you do to improve Burt, nothing will change the fact that you get two hits, and two hits only, before you die, with no chance to recover the shield that deflects the first hit. Second, there are no checkpoints in any level, which means a weak death near the end of one run will force you to play all over again. All of this combines to form what seems like an unintentionally tough platformer whose distinguishing quality—the humorous cutscenes—are kept from you by the repeated failures and easy deaths so frequently served. Some additional levels are planned, which means RunWilder has a longer story in mind here. With some tuning, this could still be a solid platformer with a wicked sense of humor. You may be wondering why I took up a review of a friend's work. Well, consider this a roast. I may be pointing out and picking on flaws but, on the whole, I do find this work to be hilarious.